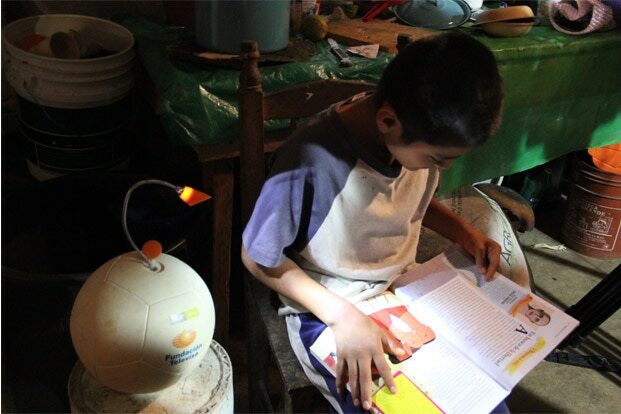 According to this New York Times article from January 2010, a group of Harvard students decided to tackle a problem in developing nations, replacing dangerous kerosene lamps for indoor lighting with a much safer LED alternative, powered by the energy of children that love kicking soccer balls. This eventually lead to the launch of a for-profit company (Uncharted Play) to produce these soccer balls, and a Kickstarter campaign to fund it. With backing by the likes of Bill Clinton, Bill Gates, Ashton Kutcher and other celebrities and philanthropists, these soccer balls were placed in the hands of poor children in Puebla, Mexico, in 2013. Were these impoverished children’s lives changed for the better? Investigative journalists traveled to Puebla, Mexico in 2014, to talk to the children that received these soccer balls, to find out how well they were holding up and if the kids still liked and used them, a year after they were distributed. What they found out was that nearly all of these soccer balls no longer worked. Many of them stopped working within a few days to a few months after the children received them, not anywhere near the 3 years that Uncharted Play said they would last. The cost of putting one of these stupid soccer balls into the hands of these impoverished children, was about $60 each. Was there a better way to accomplish the same goal? Could these impoverished people been provided with a source of light, that would be more reliable and cost effective than these silly soccer balls? Yes, and it did not require inventing something new to accomplish it. For example, you could buy a 36 LED solar and dynamo powered camping lantern at Walmart for $15.57. You could probably get them much cheaper if you bought them in bulk, straight from the manufacturer. That’s more LEDs and more light than the lamp that came with the novelty soccer ball. And I am pretty sure that if you distributed these to the same kids that received the soccer balls, they would like the camping lanterns better, and after a year of use, there would be more kids still using their camping lanterns, than the soccer balls. Even better, if you had asked the families in Puebla, Mexico if they could have spent that $60 better, they would have told you that it would have cost them less than that to be hooked up to the electrical grid, which would have provided them with much more than just light, for many years to come. If you are going to invent something to solve a problem that has the potential to change people’s lives for the better, make sure it is the best possible solution to the problem, before you begin collecting funding, manufacturing, or distributing it to those that need the solution. And make sure you involve the people that need the solution, in your research. You really can’t understand their needs unless you talk to them about it, first. Because sometimes a better solution already exists and just needs the right people to get together and make it possible to get that solution into the hands of those that need it, rather than someone running off half cocked, to invent a brand new implementation of a useless novelty soccer ball.